Once you have logged in with Instagram, Snapppt will automatically grab the most recent 32 photos from your feed and put them into Added Feed. Check over which images have been added. If there are some in there which you don't want to use within your shoppable gallery, you can remove them! Hover over an image and a dustbin logo will appear. Click Remove to remove it from your Snapppt feed. Once you have removed an image, it will still appear within Snapppt within the removed section, pictured below. 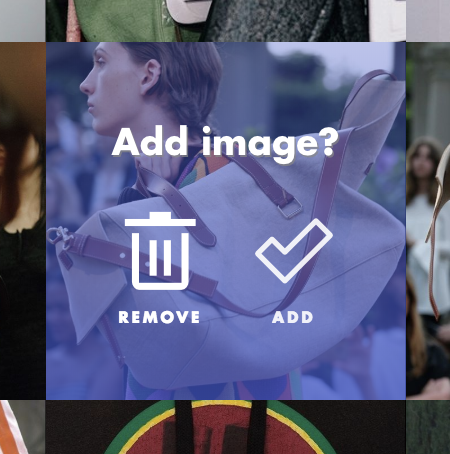 If you accidentally deleted an image or decide that you would like to use a previously deleted image, you can get it back. Go into the removed section, find the photo. Hover over the photo and you will get the option to add the image. Once the image has been added, enter in a url to direct customers to a product page. From this point, any images you upload to Instagram will be added into the "Instagram Feed" section. You can also use this tab to find any older posts which were not added to the shoppable feed automatically. You will need to login to Snapppt to publish these images to your Shoppable feed. This also gives you the opportunity to add product links to the images as you publish them. Also, remove the images that you really don't think that you will use within your shoppable gallery. Once you have curated your Instagram feed, you can start to add product tags or hotspots to your images to direct your customers to specific product pages. Find out more about adding hotspots here.